In a world where the next technological fad is always just around the corner, the connected vehicle is one development which will have a lasting impact on the fleet sector. In fact, by using the cloud to connect to other vehicles (vehicle to vehicle ) or its surroundings (vehicle to everything ), the technology will be able to let the driver know what actually is around the corner. This has the obvious safety benefit of alerting drivers to any imminent hazards, but will also allow them to avoid congestion, reducing fuel use, emissions and journey time. There are other benefits for the fleet manager, too. The data created by the cars will also be able to save downtime and cut service, maintenance and repair costs by diagnosing problems before they occur. Through the Internet of Things, vehicles will be linked to office calendars, traffic lights and even garage networks, allowing the car to check on workshop availability in the local area if maintenance is required. Technology company Cisco predicts each connected vehicle will save a fleet around £330 each year. While this may have sounded like pure science fiction just a few years ago, many fleet managers are already benefiting from connectivity by adding aftermarket telematics units to their cars and vans, while an increasing number of new vehicles are being fitted with connected technology as standard. 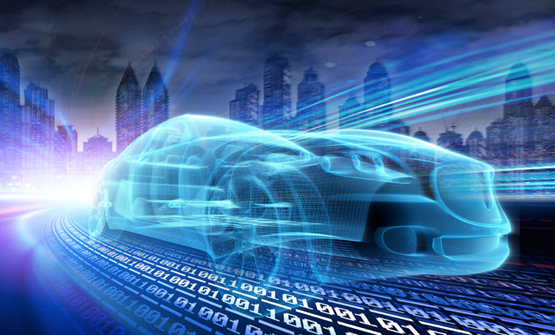 Frost & Sullivan estimates that 25% of new cars sold last year had some form of connectivity, with this proportion rising to 70% by 2022. In this feature, we look at how connected vehicle technology will change – and already is changing – the way a fleet is operated. “Safety is one of the most important areas that will benefit from connected cars and autonomous vehicles,” says Niranjan Thiyagarajan, senior consultant automotive and transportation at Frost & Sullivan. It is becoming increasingly common for new cars to be fitted with advanced driver assistance systems (ADAS), such as autonomous emergency braking, which can have a significant impact on safety: EuroNCAP research found it reduces rear-end collisions by 38%. However, ADAS technologies use radar or laser sensors, and so rely on line of sight. Connected cars will be able to gather intelligence from further down the road, even at a blind junction or in poor weather affecting visibility such as heavy rain or fog. KPMG research produced for the Society of Motor Manufacturers and Traders (SMMT) found that connected and autonomous vehicle technology could save more than 2,500 lives and prevent in excess of 25,000 serious collisions in the UK by 2030. For example, it is expected to significantly reduce nose-to-tail incidents which occur when a car at the front of a line of traffic brakes sharply. Following drivers slow only when they see the brake lights, leading to a collision when at least one of the drivers fails to react in time. With connected technology, as the first car brakes, it can also signal all the vehicles behind, allowing them to brake simultaneously. Connected vehicle technology will also be able to warn of upcoming hazards, with, for example, Volvo introducing two connected car safety features initially in Sweden and Norway: Slippery Road Alert (SRA) and Hazard Light Alert (HLA). SRA collects road surface information from cars ahead and warns approaching drivers of a slippery road section, while HLA warns of vehicles ahead that have their hazard lights on. However, it is the imminent mandatory introduction of another safety feature, eCall, which will be “a line in the sand” in the widespread adoption of connected vehicle technology, says Paul Reynolds, automotive director at Telogis. ECall is a European Commission initiative which will bring rapid assistance to motorists involved in a collision anywhere in the European Union. Vehicles equipped with the system automatically call the nearest emergency centre in the event of a collision, even if no passenger is able to speak due to injuries. Data sent includes the exact location of the incident, cutting response time significantly: the EC estimates it will cut this by 50% in the countryside and 60% in urban areas. While some cars already on sale – such as BMWs fitted with ConnectedDrive and Nissans with NissanConnect Fleet – already have connected car features through embedded modems, many fleet managers have added some of the functions of connected technology by fitting aftermarket telematics units. These produce data such as fuel consumption and incidents of harsh braking, but cars fitted with embedded modems will be able to record and relay this information without the cost of additional hardware. While this has obvious cost-saving implications, there are challenges if a fleet operates different vehicles which may produce the data in incompatible formats. Telogis fits embedded connected technologies to some Nissans and Fords, with both manufacturers offering their own telematics services to fleets. “Let’s say a fleet is running a Nissan, so you have the Nissan embedded hardware talking to the Telogis cloud and the fleet operator is able to access the data using a log-in,” says Paul Reynolds, automotive director at Telogis. “That fleet operates Ford models as well, which means that they can access all the data through the same log-in, but if it is a brand we are not engaged with then we will fit our aftermarket hardware. “This means the fleet will still get data through the same log-in so the end-user experience would be the same to a point, but then you will have those unique add-ins which we’ve developed with the OEMs. Graeme Banister, director of consulting – mobility at Frost & Sullivan, knows of companies which are postponing installing aftermarket telematics systems due to the increasing availability of connected vehicles. “There is a bit of a challenge around the return on investment of putting in aftermarket telematics units,” Banister says. Connected technology has the potential to significantly reduce a fleet’s service, maintenance and repair (SMR) costs, as well as reduce vehicle downtime. Through an app, some vehicles, such as Vauxhalls fitted with OnStar, already provide drivers with information such as fuel level, oil, and tyre pressures. However, connected technology has the ability to provide a much more detailed insight. Last year The AA began a trial of AA Connect technology in 10,000 cars and, halfway through the 12-month period, it identified problems in 17% of the cars before they led to a roadside breakdown, enabling the company to repair the fault before causing an issue at the roadside. “Although there is work still to do, we have been able to pinpoint potentially serious faults on some cars,” says Alan Ferguson, head of AA Connected Car. Each car is equipped with a small device plugged into its diagnostic socket. This monitors a range of data generated by the car, such as battery condition, electrics, engine management and other systems, identifying problems before they trigger a warning light or result in a failure. Through its Teleservices connected car programme, business mobility provider Alphabet has real-time access to data in BMW and Mini vehicles. This means that in some cases Alphabet is aware of a maintenance issue, such as engine oil being due for replacement, before the company car driver sees a message in their vehicle. Alphabet is also aware when the next service is due and when brakes are expected to be required based on usage of that vehicle, meaning it can contact the driver or fleet manager to get the vehicle booked in. Frost & Sullivan’s Graeme Banister says in the future, V2X technology will also allow connected cars to automatically search for workshop availability in a fleet’s preferred maintenance provider. The TomTom Traffic Index suggests that congestion is currently costing UK businesses approximately £767 million a year in lost productivity. Connected vehicle technology will be able to reduce fuel use and emissions by keeping traffic moving and by enabling ‘platooning’, where self-driving cars or trucks follow each other with very little distance between them. “A proportion of motorway congestion occurs when one car slows down, causing other drivers to overcompensate and brake too hard, creating a ripple effect that eventually leads to a traffic jam miles behind them,” says John Leech, head of automotive at KPMG. “I see V2V communications linked to automatic braking systems starting to alleviate this problem by 2020. Connected vehicle technology can also cut fuel costs by reducing the number of times cars stop at traffic lights. In Las Vegas, Audi’s A4 and Q7 models have linked to the traffic light infrastructure and are now able to display traffic light phases directly in the car. In the Audi system, the cars display whether it will reach the next light on green while travelling within the permitted speed limit. If not, a countdown is provided of the time remaining until the next green phase, and drivers can slow down in good time to ensure they do not have to stop. Connected vehicle technology will provide fleet managers with the opportunity to transform the make-up and operation of their fleet, says Graeme Banister of Frost & Sullivan. If there is congestion or an accident, a car can go beyond asking about taking an alternative route and advise that the best way to get to a destination is by taking the train instead, he adds. “Therein lies the opportunity to tie everything up in terms of total cost of mobility, so the connected car will play a huge role in terms of moving from the current total cost of ownership model to the total cost of mobility,” says Banister. “It can start to make decisions like ‘do you know what, based on your calendar and on how I’m interacting with your other stuff, the car is not the right vehicle for you today’. Banister says connected car technology could also make a fleet of vehicles cost neutral, or even make money for the organisation. “There are still going to be company cars exclusively run by one person, but as we move further towards connected cars that are interfacing with you as an individual, they will be much easier to share,” he says. “Within companies there are many company cars that can be turned into corporate cars or car share vehicles. Banister says there is the potential to expand this further. “If you are on a business park, why wouldn’t you let other people on that park use your vehicles?” he asks. “I fully believe there is an efficiency coming down the path which will drive the cost of mobility down to zero.